Remembering the foundation day of Central Philippine University on October 1, I reflected on her core values. I’m very grateful that my Alma Mater did not only teach me academic knowledge. I also grew spiritually at CPU. I learned her core values that for me, are far more important than the academic degree I earned. CPU’s core values are deeply embedded in four generations of our family. My grandfather, Raymundo Bais was alumnus of Central Philippine College. My parents, Nenita Bais and Malvar Castillon are both graduates of the College of Theology. I and my siblings, Asiel Nils (Chem Eng’g) and Ivan (AB History) graduated at CPU. My wife, Jewel Kwe is a Centralian (Commerce) and our daughter, Jadyn attended nursery, Kinder 1 and 2 at CPU. Basing from my parents’ life, I could say that the core values of CPU preceded her academic programs. Do you know why? My parents came to know the Saviour Jesus Christ through the CPU Gospel Team that visited their respective towns. Then their new found faith led them to study at CPU. Basically, we could see similar pattern in CPU’s establishment. The Baptist missionaries came to sow the Gospel seed and later organized the school that became Central Philippine University. As a Centralian, are you aware of your Alma Mater’s core values? What is your understanding of faith, character, justice, stewardship, and excellence? How far have you gone in putting into practice these core values? 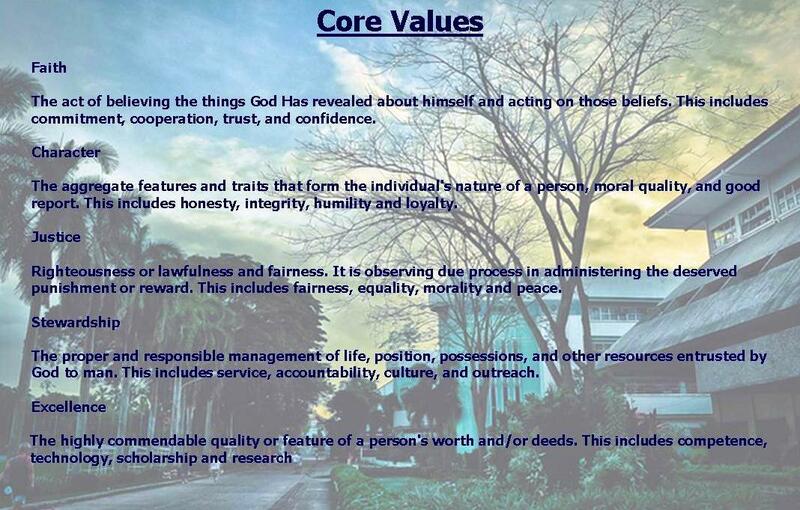 If our founding fathers were alive today, would they be proud of us as Centralians who have stood for CPU’s core values? On 1 October 2009, I had the rare chance to make a stand for justice. Eventually, true to what CPU has taught me, I found the justice that I sought. Let us celebrate the foundation of our Alma Mater, Central Philippine University and bring great honor to her through standing firm on the core values she taught us, anywhere we are, no matter what we have achieved. CPU’s core values are deeply embedded in our family. My parents are both graduates of the College of Theology. My parents came to know the Saviour Jesus Christ through the CPU Gospel Team that visited their town. Then their new found faith led them to study at CPU. Basically, we could see similar pattern in CPU’s establishment. The Baptist missionaries came to sow the Gospel seed and later organized the school that became Central Philippine University. If our founding fathers were alive today, do you think they will be proud of us – Centralians who have stood for CPU’s core values? On 1 October 2009, I have the rare chance to make a stand for justice. I filed a labor complaint against my employer. Eventually, I found the justice that I sought. Let us celebrate the foundation of our Alma Mater, Central Philippine University and bring great honor to her through standing firm on the core values she taught us.